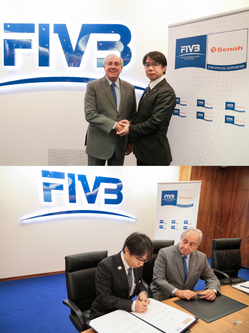 On February 15, in Lausanne, Switzerland, Dr. Ary S. Graça F°, President of Fédération Internationale de Volleyball (FIVB), and Mr. Tetsuya Ozaki, President of Senoh Corporation, signed a new agreement that makes Senoh the Official Supplier for indoor and beach volleyball equipment for 8 years. This partnership brings Senoh opportunities to support indoor and beach volleyball events and competitions hosted by the FIVB, and to expand volleyball sports with Senoh equipment to all over the world. For the next 4 years and so on, Senoh is ready to move forward to further volleyball development with FIVB. Through research and development of reliable and safe equipment, Senoh will continue to contribute to deliver the joy and excitement to volleyball fans, players, and communities around the world.